Billy’s Mum, May Hubner, and Brumas, Circa 1961-2. Photo copyright of Jack Hubner. Whilst appearing at the South Pier, Blackpool’s summer show with the Mudlarks, Billy was introduced to The Mudlarks’ mother, Mrs Mudd, who was a breeder of pedigree poodles. Billy decided to buy a white poodle, which was called Brumas. Why Brumas? Well, back in 1949 a polar bear cub was the first to be born and raised in captivity in the London Zoo. The bear cub (a female) was called Brumas - so, white polar bear, white poodle (a boy, I gather!). From around 1960 - 63 Billy was living in a flat at 16 Maiden Lane, just off the Strand in London. As it was a multi-occupancy flat, Billy soon realised that having a dog there was not such a good idea after all and, after only 3 weeks, he returned to Paisley with the dog and left it with his parents, who kept it for the rest of the dog’s life. Sadly, it was killed in a street accident a few years later. 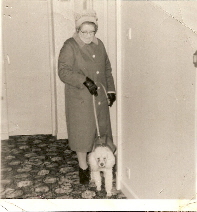 My thanks to Jack Hubner, Billy’s brother, for sending me the photo of his Mum and Brumas going walkies! Billy preferred cats, and in Australia he owned a cat called Dolly. Why Dolly? Well, when visitors came to visit, they would ask the name of the cat and, when told, they would always say “Hello, Dolly!” Cue for song!